In this post we are going to review wget utility which retrieves files from World Wide Web (WWW) using widely used protocols like HTTP, HTTPS and FTP. Wget utility is freely available package and license is under GNU GPL License. This utility can be install any Unix-like Operating system including Windows and MAC OS. It’s a non-interactive command line tool. Main feature of Wget of it’s robustness. It’s designed in such way so that it works in slow or unstable network connections. Wget automatically start download where it was left off in case of network problem. Also downloads file recursively. It’ll keep trying until file has be retrieved completely. First, check whether wget utility is already installed or not in your Linux box, using following command. Please install it using YUM command in case wget is not installed already or you can also download binary package at http://ftp.gnu.org/gnu/wget/. The -y option used here, is to prevent confirmation prompt before installing any package. For more YUM command examples and options read the article on 20 YUM Command Examples for Linux Package Management. The command will download single file and stores in a current directory. It also shows download progress, size, date and time while downloading. Using -O (uppercase) option, downloads file with different file name. Here we have given wget.zip file name as show below. Here we see how to download multiple files using HTTP and FTP protocol with wget command at ones. ==> TYPE I ... done. ==> CWD (1) /gnu/wget ... done. ==> PASV ... done. ==> RETR wget-1.10.1.tar.gz.sig ... done. You can store number of URL’s in text file and download them with -i option. Below we have created tmp.txt under wget directory where we put series of URL’s to download. In case of big file download, it may happen sometime to stop download in that case we can resume download the same file where it was left off with -c option. But when you start download file without specifying -c option wget will add .1 extension at the end of file, considering as a fresh download. So, it’s good practice to add -c switch when you download big files. When you start download without -c option wget add .1 at the end of file and start with fresh download. If .1 already exist .2 append at the end of file. See the example files with .1 extension appended at the end of the file. With -b option you can send download in background immediately after download start and logs are written in /wget/log.txt file. Continuing in background, pid 3550. With Option –limit-rate=100k, the download speed limit is restricted to 100k and the logs will be created under /wget/log.txt as shown below. ==> TYPE I ... done. ==> CWD (1) /debian/debian-cd/6.0.5/i386/iso-dvd ... done. ==> PASV ... done. ==> REST 2825236 ... done. ==> RETR debian-6.0.5-i386-DVD-1.iso ... done. With Options –http-user=username, –http-password=password & –ftp-user=username, –ftp-password=password, you can download password restricted HTTP or FTP sites as shown below. With Options –version and –help you can view version and help as needed. 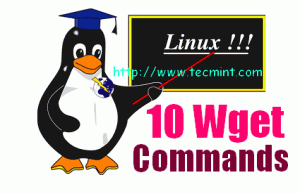 In this article we have covered Linux wget command with options for daily administrative task. Do man wget if you wan to know more about it. Kindly share through our comment box or if we’ve missed out anything, do let us know. We are facing slowness when we are sending traffic using wget in linux machines through TCL . Traffic passing gets struck in the middle when the file size is more than 100MB. Hence we are unable to meassure the bandwidth during download. Please suggest any way to address this issue. You made my day. I tried without the ftp:// and failed one time after the other. I want to make a script to check a website and download the latest available version of a deb file and install it. The problem I have is that on the website, each time the version changes, so the file name is changed, so I can not know the exact name to give the order to wget. I wonder if there is any way to include wildcards in wget, or similar option. As an example, suppose you want to download each x time the latest “Dukto” in 64 bits. How i can tell wget to look in that directory and download the dukto*.deb? what does is mean by “downloads file recursively” ? ?